There is some confusion about the name "Capua," even among Italians. Let's say you are going to "Capua" because you're interested in the place that, between the 7th century BC and the 8th century AD, was the largest city(!) in ancient Italy after Rome. 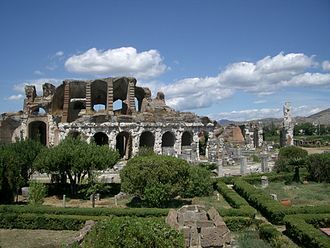 It had an amphitheater (image, right) almost as large as the Colosseum and was the capital city of what the Romans called Felix Campania (Happy Campania). You want to see all that; thus, you go to the town called Capua today, fewer than 20 miles —as Felix the Happy Campanian crow flies!— north of Naples. You go and learn that you are in precisely the wrong place. You have to back up a bit to the south, maybe about 3 miles, to the town called Santa Maria Capua Vetere. That is where you will find ancient Capua and the ruins of the grand amphitheater. The original site was a Villanovan settlement (the earliest Iron Age culture of central and northern Italy, so named for the archaeological type site, Villanova, near Bologna). The first true city was then Etruscan, founded in about 800 BC and became the most important Etruscan center of inland Campania. The name, itself, is Etruscan, Capeva, and meant City of Marshes. (See Etruscans in Campania). The area was then taken over by the Oscan-speaking Samnites, the fierce enemies of the Romans and then finally taken by the Romans, themselves, as power in south-central Italy irresistibly shifted to Rome. At the beginnings of the Second Punic War (218 BC – 201 BC) in the great struggles between Rome and Carthage, Capua was a military power only slightly less important than Rome or Carthage, themselves. The city defected to Hannibal and became the Carthaginian power base in Italy for a while. For its rebellion Capau was destroyed in 211 B.C. by the Romans. In modern Italian, one still uses the expression "to give oneself to the Ozi di Capua" —the sloth or idleness of Capua— to mean that one is living a lazy and indolent life, this in reference to the notion that Hannibal's army grew so soft from living in the lap of Capuan luxury that they were unable to soldier on effectively. It's probably not true, but there are still ruins of the many thermal baths in the area. As the Roman empire dissolved and Italy was invaded by Goths, Byzantine Greeks and Lombards, Capua suffered great damage and was finally almost totally destroyed by Saracen invaders in 841 AD. At that point the inhabitants fled a few miles over to the old river port on the Volturno, named Casilinum. It is a short distance to the NW of ancient Capua and surrounded on three sides by the river. The refugees refounded it with the modern name of Capua. What is now Santa Maria Capua Vetere (ancient Capua) then splintered into smaller hamlets built around countryside residences and churches. The people actually used the ancient monuments (such as the amphitheater) for building material. (Of the original 90 or so arches in the amphitheater, very few remain.) That situation changed at the end of the 18th century when Bourbon rulers of the Kingdom of Naples took an interest in the great archaeological history of the area. Today there are a few traces left of the ancient buildings: the amphitheater, the cryptoporticus (covered passageway), the theater, the baths, the temple of Mithra, etc. Fortunately, there are some fine museums. One is the Campania Provincial Museum, called by archaeologist Amedeo Maiuri "the most significant museum of ancient Italian civilization in Campania." It is in the modern town of Capua. Another is the Museum of the Gladiators in Santa Maria Capua Vetere. If you have not read the first item on this page (directly above) it would help to do so. The province of Caserta contains items of extreme interest in the study of paleo-Christianity (roughly defined as the first five centuries of the Christian faith). This one is in the town of San Prispo, approximately midway between Capua and Santa Maria Capua Vetere. The central nave ends in the apse. The two side naves are lined with devotional shrines and statuary. The massive wooden pulpit is dated to 1750. Particularly interesting is the chapel of Santa Matrona within the church. It is what is left of the paleo-Christian basilica dedicated to San Prisco. Isolated from the main building is the large three-level rectangular belfry. Each level has arches and windows. The church of SCSP has been subject to constant episodes of restoration, both of the structure, itself, as well as of the internal religious items both ancient and modern. Episodes of damage have been extensive and include earthquakes (as recently as 1980) and damage from WW2 (the area is next-door to the path of the German retreat and Allied pursuit from Naples to Rome (1943-45). Technically, the entire complex of the church and out-buildings is the Basilica Arcipretale of Santa Croce and San Prisco (that is, the seat of the "archpriest" for the two areas, which constitute a single parish). The address is via Starza 5 in San Prisco, Caserta. San Prisco borders on the municipalities of Capua, Casagiove, Casapulla, Caserta, Curti, and Santa Maria Capua Vetere. 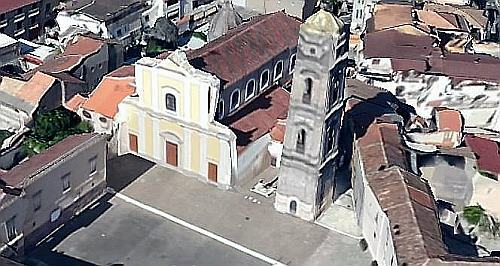 The paleo-Christian interest, as noted, is due to the presence within the church of the chapel of Santa Matrona (shown below); that is, what is left of the paleo-Christian basilica dedicated to San Prisco. Some historians place the original construction of that early basilica at the year 506, basing the claim on an inscription found in place. Whatever the case, most opinion converges on the first half of that century as the likely time of construction. There is considerable legend connected with the construction of the chapel within the church. Matrona is said to have been a noblewoman originally from Lusitania (modern Portugal) and to have discovered the remains of this first sainted bishop of Capua, St. Prisco. Legend says that she was granted a miracle by St. Prisco; she was ill and went to Capua to Prisco's tomb, the first sainted bishop of Capua, and was miraculously healed. She is said to have found the ancient sepulcher of St. Prisco, which, in the course of time, was again lost. She found the tomb near the so-called "distaff" (a distaff is that long tool with a spindle used to hold unspun fiber as it is worked into thread, but here it refers to the name for an ancient Roman funeral monument on the Appian Way). That discovery led to the construction of a basilica in honor of the St. Prisco. Matrona stayed there for the rest of her life, herself honored as a saint and invoked to protect from intestinal epidemics, the pains of childbirth, and cholera. The remnants of her chapel, the primitive paleo-Christian basilica dedicated to San Prisco, are thus said to be in the yellow church you see here. The Chapel of Santa Matrona is a funerary sacellum (shrine) It is rectangular with columns topped by ancient capitals at the corners. 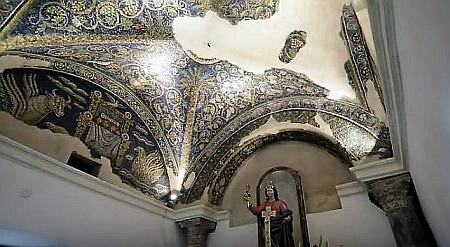 In the main part of the church, in the apse (the domed or vaulted projection at the end of the church), there is also a marble tub that served as an altar. Tradition says that it held the remains of the sainted noblewoman. It is highly probable that the tub was taken from a villa in ancient Capua. On the vault of the chapel and on three of the four lunettes there are sparkling mosaic decorations (pictured) in which the colors themselves are heightened by a generous use of gold, all set against an intense background of blue. Four palms, symbols of martyrdom, follow the lines of the vault. The four sections of the vault display vine shoots, bunches of grapes, and two birds pecking at the grapes. The decorative mosaics in the lunettes that close the arches, however, are only partially intact; one of the lunettes is entirely gone and another retains only the left-hand portion. The lunette above the entrance displays a bust of Christ Blessing with the apocalyptic letters, alpha and omega. The majestic countenance of Christ is in the eastern Christian tradition. The mosaics are in the great Byzantine-influenced paleo-Christian mosaic tradition that flourished in the Campania region of Italy, absolutely comparable to the traditions of Rome, Ravenna and Milan. Dating them exactly is not that easy, but estimates seem to converge on the years from the early 500s to the early 600s. There is, however, no nimbus (halo) around the heads of the symbols of the Evangelists; that, plus, the decorative elements in the fully classical tradition supports the claim for an early dating, the first half of the 500's.